The SRIA promotes a program of steel stewardship, seeking to engage the whole steel reinforcement supply chain in adopting improved environmentally sustainable practices. SRIA members led by a sustainability committee support environmental sustainability to measure and benchmark the industry’s environmental, social and economic performance. This is a continual process of benchmarking, monitoring and measuring progress. The SRIA has established and maintains global networks to deliver improvement programs in responsible best practice to the local steel reinforcing sector. The SRIA supports the Building Products Innovation Council (BPIC) in its three major areas of building code reform, product certification, and sustainability. Reinforcement data is being submitted to a national materials data base that will create a ‘level playing field’ for all construction materials. This is part of a Life Cycle Inventory for construction materials. It will be used in Life Cycle Assessment, and ultimately in Sustainability Rating Tools for more energy efficient and sustainable building construction. Further details can be found on the BPIC website. SRIA’s goal is to encourage the economic, elegant and innovative design and construction of reinforced concrete structures through practical solutions to meet the diverse and ever changing needs of the Australian building industry. SRIA Members support Environmental Sustainability to measure and benchmark the industry's environmental, social and economic performance. This is a continual process of benchmarking, monitoring and measuring progress. The SRIA has established and maintains global networks to deliver improvement programs of responsible best practice to the local steel reinforcing sector. Capable of being used in an innovative way to lessen social, environmental, and economic impacts. The SRIA supports the Building Products Innovation Council (BPIC) in its three major areas of building code reform, product certification, and sustainability. Reinforcement data is being submitted to a National materials data base that will create a “level playing field” for all construction materials. This is part of a Life Cycle Inventory for construction materials. It will be used in Life Cycle Assessment, and ultimately in Sustainability Rating Tools for more energy efficient and sustainable commercial and residential building construction. Clients who emphasise sustainable development want to know if steel reinforcing is a sustainable construction (“green”) material. Sustainable development requires the selection and sensible application of sustainable construction material. SRIA is contributing to rating tools and educates the market in minimising the environmental, social and economic impact of steel reinforced solutions. The SRIA promotes innovation through new technology and best practice in the use of steel reinforcing in the building and construction sectors. High quality technical support and information services are provided to the Australian building industry. 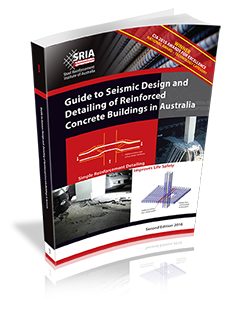 The SRIA also supports all Australian universities teaching Civil/Structural Engineering Degrees making available to them a practical reinforcement lecture package, handbooks and a resource CD. This industry linkage is invaluable for a practical insight for the future designers and detailers of reinforced concrete.